The way I get to listen to promos lately is to load them up on a USB stick, a whole bunch of them, and take with me in the car so I can shuffle through them and see what fits the mood better. The unfortunate losers in this setup is the last letters of the alphabet, since by the time I get to them there is always a pair of earlier letter bands I end up picking for a weekly review. 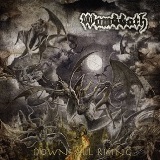 Given that their moniker starts with a "W", Swedish Wombbath comeback Downfall Rising languished a bit on the aforementioned USB, but I felt the need to review it, so the dedicated death metal fans know what is in the store for them (of course, THE most dedicated ones are ahead of me on this release). Wombbath is not to be confused in spelling with a docile marsupial wombat. Instead, they are a remnant of the plentiful 90s Swedish death metal scene. The band went dormant at first, then even split up somewhere around 2004-2005, but thanks to the persistence of the main guitarist/songwriter Hakan Stuvemark, Wombbath is now resurrected. Downfall Rising is squeezing several direct and related to death metal ideas in compact 32 min. The Intro sets the mood by placing the listener in the movie theater, old creaky film projector rolling, where a horror movie is being played. A sudden female scream ... and horror movie becomes reality. For a number of tracks Wombbath proves that grind and slop of death metal can combine into one sweaty and meaty package. There is also doomy deliberation in Fall of the Weak, and almost symphonic feel to the blasting becoming double bass in the epic I Am the Abyss. Subtle melody flows in that track as well as in Fall of the Weak, or projection of almost cliche powergrind in Putrid and Bound and Paid in Blood are other notable moments. The flick closes in an apocalyptic dramatic fashion with a short sketch Abandoned Furthermore, something that sounds like an experiment or an afterthought altogether. You can say that with Downfall Rising Wombbath didn't break any new ground, but that notion probably applies to a large number of death metal bands out there. The genre is just not very conducive to upheaval. What the album reminds me of distinctly is the zombie walk, as depicted so colorfully by my favorite pair of techno thriller authors Douglas Preston and Lincoln Child in their book Cemetery Dance. A zombie can walk in uncertain sloppy shuffle, but when seeing his victim the creature can shift into a swift purposeful attack. There is little room for a poor soul to escape afterwards. Vocalized by a confident growl of Johnny Pettersson, Under Apokalypsens Svarta Vingar and Underneath that Rotten Soil could be the music soundtrack to Cemetary Dance. Downfall Rising is for the fans of old Carcass and Autopsy, but the fans of the Stockholm sound, those into Dismember or Centinex, will enjoy the album as well.